Because it is the 10th anniversary of the World Trade Center attacks here in America, I feel I should write something about that event. It's possible you're going to think that I'm a terrible, uncaring person for what I'm about to say. I invite you to consider that these are simply my feelings and my attempt to wrestle with those feelings, not any sort of sweeping notions about what September 11 should or shouldn't mean to everyone. Everyone responds to something like this differently. So: I have shed no tears over the 9/11 attacks in the past 10 years. I am sure this would be different if I had personally known and loved someone who was killed that day. I would grieve over their death the same as if I lost them at any other time unexpectedly, unfairly. But I reject the notion that I'm obligated to mourn the lives lost on 9/11 more than other lives lost at other times simply because there were so many of them at once. Perhaps I should cry over every death that happens anywhere, but we're wired not to do that or we'd go crazy. We cry over the deaths that affect us most deeply. Still, I don't think the death toll is the only reason we commemorate 9/11 and have stitched its importance so deeply into the fabric of our country's history. Our priest last night talked about that day as being one that shook us up because we thought we were safe. We thought we lived in the safest place in the world and that no one could penetrate our security to cause death and destruction like that. I guess I must never have had that kind of illusion. Even at 15, I had an awareness in the back of my mind that at any moment, a bomb could go off in the building I was in, a tornado could rip through my school, a sudden heart attack or aneurysm could steal my life in an instant. Likely? Maybe not. But certainly possible. I didn't consider myself any safer from death then than I do now. If anything, I'm more at peace now than I was then with the idea of dying, as I've gained perspective and wisdom with age. I really have very little fear of death, something that was confirmed for me last week when playing a game of hypothetical questions at a friend's house. I was always willing to choose death over a drastic reduction in my quality of life. God is God whether I am alive or dead. When my time comes, it will certainly be very sad for those who are left, but I will be no worse off -- and rather better -- for leaving the world behind and being with God. Basically, I can't say that 9/11 made me more afraid of death. Perhaps my country's military defenses make death by certain types of attacks less likely, but I never considered that they were impenetrable. There are things I fear far more than death. When I read about other countries, historical and present-day, where people live in fear that they will be arrested for no reason and tortured, I am grateful that I don't have that fear on a daily basis. I am grateful that I have so many freedoms that I don't have to worry about accidentally doing or saying or wearing or eating the wrong thing and being imprisoned for it. I don't have to worry about these rules changing arbitrarily and at the whims of the government. These things that I do fear -- mistaken imprisonment, torture, lack of freedoms, governmental exercise of power outside the legislative system -- became more prevalent in our country following 9/11. And it wasn't a direct result of the 9/11 attacks, but rather our government's response to those attacks. I understand wanting to maintain a certain level of security in the country, and it's worth preventing deaths when those precautions can be taken, to a certain extent. But if you accept that everyone will die eventually, and that none of us know the exact day and hour we will die, then it's clear that there has to be a limit on the sacrifices we make to prevent death. This isn't meant to be political, really. It's simply my own thought process through the notions of fear and death, of freedom and security, of what really shakes me up and makes me afraid. Not everyone feels the same way I do about death, and that's fine. If I were able to cry for the people killed on September 11, 2001, I would also cry for the many, many civilians who have lost their lives in Iraq and Afghanistan -- more people I don't know, who have died needlessly. I would cry for the people both outside and inside the U.S. who are wrongfully imprisoned and tortured so that their government officials can feel slightly safer. Don't forget this: We also saw on 9/11 how people can do amazing, selfless things for others. How people can set aside differences and transcend their self-imposed boundaries to come together, work together, and mourn together. Heroic acts on that day and every other day deserve recognition. Maybe the legacy of 9/11 can be one not of fear and death, but of the memory and understanding of what service looks, what tolerance looks like, of what we as humans are capable of when we have reason to step up and be bigger than ourselves. 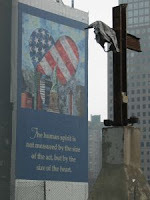 This is what I am thinking and feeling today, September 11, 2011. I am closing comments because, unlike every other post on here, this isn't something I'm putting out there for discussion. I'm putting it out there because I feel obligated to say something, and I can't lie to you. I don't want to. I just want you to know that if you aren't crying today, it's OK. You're not alone. Update: I've decided to open comments after getting some positive feedback on the post, and reading Rabbit's great response. Please be respectful. What I mourn is the hate, the hatred that caused it and the hatred that has come out of it. Our response to it might even be sadder than what happened, I agree. I don't think it made me feel less "safe" but it made me realize that people hated us, and that we used that as a poor excuse to hate them too. What's interesting is that I didn't really think about people hating the U.S. on 9/11; I guess it seemed like such an isolated event perpetrated by an extreme group that the terrorists' particular feelings didn't seem to be the point. When I did realize that people hated the U.S. was when we went to war; it seemed like then there was a great outpouring of disapproval from other countries, and that affected me a lot more. And since, as you said, we responded to hate with more hate and violence, who could blame them for looking down on us? Thank you for this. So much of what you've written resonates within my being.